white feathery blooms! - What is this little plant? It is a perfect foil for the Farfugium! cherawkee, I've lived here for 17 years and think I've seen all of 3 snakes, none of which were around the steps. I've had more fender benders in that length of time than I've seen snakes. I say go for it and see what happens! Good luck!! 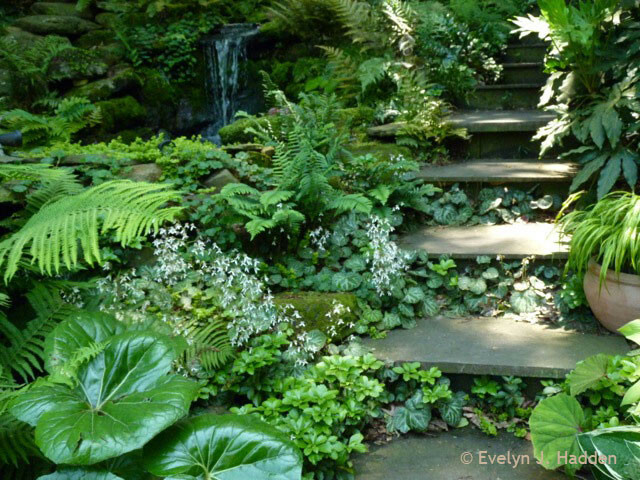 What is the large-leafed plant to the left of the steps in the corner? Hi. That plant is farfugium japonicum gigantea. It used to be classified as a ligularia so you may find it in nurseries as "Giant Ligularia". It does best in very moist soil and part sun to light shade. It's a great plant. I hope you find it!